Who's really behind the organic food brands we choose? Organic "this" and natural "that" doesn't automatically make something good or even better, but a willingness to learn about the whats, whys and hows of companies committed to offering these products can shed a lot of light on what we're really buying and thereby supporting. Learning about the businesses we buy from and most especially the people behind our food is not only good due diligence for health reasons, but it also involves each of us as active, informed participants in creating a marketplace we can be proud of. It makes our shopping experience more satisfying (and simpler) and better connects us to what we eat too. Buying local foods from our farmers markets and CSA's afford us the opportunity of actually meeting and many times even seeing where our food comes from and how it's made. Times when we can't buy local make it all the more important to learn what we can about the natural and organic food brands we do choose. An eye-popping peek behind the organic industry curtain about ownership of major organic food brands and product lines. "The Neurotic Eater's Grocery List"
A superbly informative breakdown of the health, environmental and ethical issues of supermarket foods by grocery section. Fantastic interactive graphic conveniently shows the giant food processors behind these 92 well-known organic food brands. Comprehensive and detailed reports and scorecards for organic food brands including dairy, egg and soy producers. Ratings based on health, environmental and social impacts from product- and company-level analysis for over 22,000 food products + recommended alternatives. Find brands committed to and certified in fair trade practices. Retailers and manufacturers can also find fair trade ingredients and producers. Learn about the health and environmental benefits of grass-fed meats, eggs and dairy. Plus a state-by-state directory of farms for meats, dairy and other wild edibles including nuts and berries! Get the lowdown on labels. "Natural" this, "grass-fed" that and the list goes on and on. Learn what the labels mean and what it means for the food you choose. Excellent primer on how to avoid genetically modified organisms (GMO) in our foods including lists of verified non-GMO brands by food category. Download their guide or app. According to the Non-GMO Project, stick with organic foods because certified organic products cannot include GMO ingredients and avoid common at-risk ingredients like soybeans, corn, canola, cottonseed and sugar from sugar beets. A powerful reminder to know thy food, now thy ingredients -- from a food industry insider. Coupons? Coupons? Who wants coupons? Get organic food coupons for some of these and other brands. Mavenjoy loves to champion small businesses any chance we get, and we are all too happy to sing the praises of these major organic food brands when they genuinely walk the sustainable talk advancing environmentally-sound, healthy and socially just practices especially when they also boost up our small businesses, family farms and local communities. We're shining a light on a few of our favorite major organic food brands and businesses that really "wow" us -- check 'em out. Some links are to our affiliate partners that we've handpicked because we think that they're extra special and you deserve to know about them. If you click on a link to one of them and make a purchase, we get a small percentage and thank you very much for supporting us both. For organic milks, eggs, butter, cheeses + meats including beef, chicken, pork and more. The Wow: the largest organic and farmer-owned cooperative in North America with over 1,600 farmers in all regions of the country. That business model and its multi-faceted dedication to sustainability directly preserve our nation's small family farms and rural communities while providing nutritious, delicious food that goes well beyond "certified organic". Check out online specials for Organic Prairie. For vegetarian natural and organic frozen foods (like so, so tasty pizzas, pot pies, burritos and so much more!) plus soups, sauces and salsas. The Wow: Truly a family business (yes, Amy is a real live person, the daughter), Amy's started in the family home (and barn) with three generations playing active roles in its unfolding. A fact you can actually taste. Amy's has perfected "made from scratch" taste, so good that you know it only as delicious, however it's also a lot more -- it's vegetarian, organic, non-GMO, with no trans fats too. Mavenjoy Extra: Grab a free printable grocery coupon for Amy's. Mavenjoy Tip: Special diet? No problem, check out Amy's products for whatever your dietary needs and concerns are and filter by diet. Family-owned and operated, certified organic, non-GMO verified and fair trade certified offering for organic cereals, toaster pastries + many gluten free options (they're also our pick for waffles -- try them in these nifty waffle recipes) and more. Great prices on Nature's Path here. Always a sucker for a love story...Bob and his wife Charlee began the business over three decades ago when Charlee wanted a healthier lifestyle for their family and based it on wholesome, whole grains. It spread from there to their local community with the original Bob’s Red Mill store, still in operation today and where you are likely to find Bob and Charlee. Thanks to Bob's vision and generosity, it is proudly employee-owned through an Employee Stock Ownership Program (ESOP) with over 200 employees and producing lines of natural, certified organic, and gluten-free milled grain products. Mavenjoy Extra: Shop great prices at this online favorite for Bob's Red Mill products or grab a printable grocery coupon for Bob's. We've been fans of NOW for its quality vitamins, essential oils and nutritional supplements for years, but only recently realized they offer so much more like nuts, dried fruits, seeds flours, snacks and baking mixes. NOW Foods is still a family-owned business that started over 45 years ago with a commitment to providing value in products that help people lead healthier lives. Their dedication to charitable causes, food and agriculture advocacy + environmental and animal wellness stewardship solidifies just how much this company is walking the talk of healthy living. Mavenjoy Extra: Buy NOW products here and always get free shipping, with no minimum purchase required and no tax! From genuine beginnings to create a nutritious energy bar by going to the "best baker he knew, his mom" and naming his signature product after dad, Gary Erickson has built a truly sustainable business serving up products made with healthier more wholesome ingredients and a solid commitment to organic farming. From its LEED Platinum certified headquarters to its myriad of employee support programs (in 2010 the company implemented an Employee Stock Ownership Plan (ESOP), CLIF walks the talk with a growing line of delicious, quality health and lifestyle foods. Mavenjoy Extra: Shop CLIF at 25-50% retail prices. For natural and organic beans, grains, dressings, gravies, sauces, bulk organic foods and more. The Wow: Frontier wants you to really get to know its company, and no wonder, given its extensive practices of social responsibility and environmental sustainability for creating high quality products, competitively priced. A two-man operation that started at a cabin by an Iowa river, grew into a co-op that to this day is owned by its wholesale customers and is comprised of two natural and organic food brands, Frontier and Simply Organic plus its aromatherapy brand, Aura Cacia. Two of its too-many-to-list social and environmental practices worth special note are its Well Earth ethical sourcing program and its 1% Fund that donates one percent of its Simply Organic sales to support organic groups and causes. Definitely a company worth getting know and supporting! 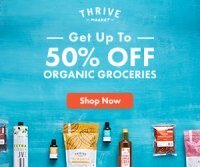 Mavenjoy (Gluten Free) Picks: See Simply Organic's certified gluten free foods (Note: link to GF currently being updated) and buy them at this online shopping favorite. Mavenjoy Extra: Get printable grocery coupons for Simply Organic products. Your superfood source... try Nutiva chia seeds, coconut, hemp and more. A values-driven, private company revolutionizing health foods with innovation, high standards and deep commitments to its team, customers and the planet. Organic non-GMO and kosher too! Check out convenient shopping for Nutiva products with free shipping, no minimums and no tax! Read our rave about Newmans Own Organics too and also get the scoop on another one of our favorite organic food brands for cookies, and brownies and biscuits-- oh my! For natural and organic meats including hot dogs, bacon, sausage, cold cuts, cheeses and more. The Wow: Supplied by over 300 small, family farms, Applegate provides minimally processed meats with no antibiotics, hormones or artificial preservatives. They advocate for smaller portions of higher quality, sustainably-produced animal products on tables at home and at school -- they're big supporters of the Healthy Schools Campaign and a lead sponsor for "Cooking Up Change", a school lunch competition for high school student chefs. Mavenjoy (Gluten Free) Picks: Applegate's burgers, bacon, deli meats and yes, even hot dogs are all gluten free and casein free. Grab a printable coupon for Applegate. What began as a 2 1/2 acre raspberry farm has blossomed into 200 organic farmers dedicated to providing pure produce that nourish people and planet. The Wow: Earthbound is committed to cultivating future generations of healthy food by funding scholarships for environmental stewardship and farming as well as providing fresh foods to school and community programs. Grab a coupon for products such as frozen and dried organic fruits and vegetables in addition to farm fresh produce -- in 100% post-consumer recycled packaging. **MORE** (Store-bought) Cookies - One of Our Brand Faves! Our take on our favorite organic food brand for cookies and the story behind this amazing company and cookie.